Summon your wind-up gentleman minion. If “clockwork Hildibrand” doesn't quite roll off the tongue, both “minion of enquiry” and “mammet extraordinaire” are acceptable alternatives. Though he has once more taken to the heavens in a selfless act of sacrifice, Inspector Hildibrand lives on in the hearts of all whose lives he touched with his inimitable brand of gallantry, perception, and panache. 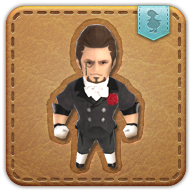 Wind him up and let him follow you as only a Manderville can. Increases ATK and DEF of all allies within range by 40. The action party is immediately withdrawn from the playing field after execution.